Although Millennials are well–known for our hesitance in permanent home or car ownership, it doesn’t mean we care less about home decor and styling up our living quarters. We could live in a small apartment and still go all out when it comes to interior design. Most of us are way past our pink, velvet, fluffy furniture days. Furnishings for us Gen Y-ers now revolve around going green, being minimalist, using recyclable materials, and sustainability. Make your trips to IKEA, the flea market, or any furniture store in general , even more interesting when you go on a hunt for this season’s “it” pieces which are also hopefully easy on the wallets. 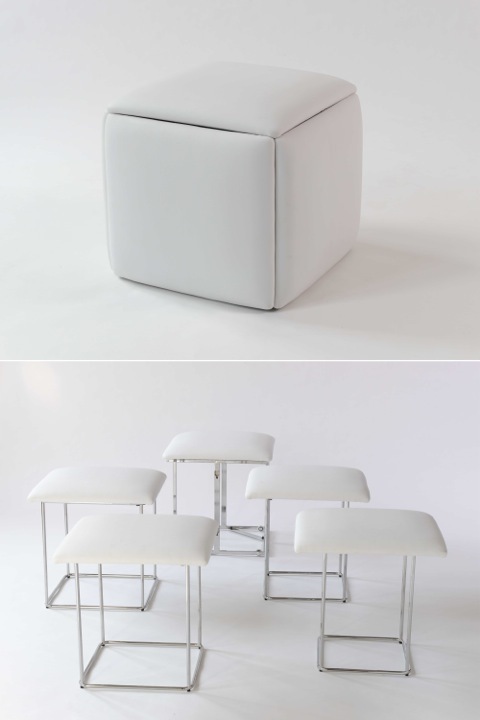 The “Cubista” is an ottoman that converts into stools/seating for five people. Home alone and want enough room in your apartment to dance and run around? If your girlfriends decide to come over with dinner to chitchat, just pull out, disassemble and you automatically have five seats ready. These stainless “Floating L Shelves” from West Elm are a combination of sleek and minimalist. From books and picture frames to accessories, this durable piece can hold basically anything. Pick from bronze and earthy colors to complement the fall season atmosphere. This neutral tufted headboard from Wayfair will make you want to stay in bed all day. Made popular by Scream Queens’ Chanel Oberlin, this piece adds a luxurious touch without the overly-lavish price. Plus, because of its cushiony surface, you don’t have to worry about accidentally getting a bump or bruise on your head. Marble can appear overwhelming and luxurious, but if paired with the right home decor strategically placed around the room, you can pull off the look. With a marble table top, your morning coffee sessions are bound to feel a bit more ~elegant~. Marble and wood go well with each other, plus they’re sturdy, so you won’t have to worry about replacing it anytime soon. This coffee table/end table on Amazon set is a perfect, AFFORDABLE touch to make any living room look more adult. Whether or not you’re feeling your outfit or look for the day, having a statement mirror is bound to make your reflection look, and feel, better than actually seems. We love this mirror from Joss and Main. It’s trendy and practical and perfect for every season. Fluorescent lights have a way of drowning a room in bright light. For a more ambient feel, lamps can be placed in room corners – or in the middle. If you’d rather not take up valuable space on your coffee and side tables for table lamps, there’s always the option of settling for floor lamps. The appropriate lamp style and the way we illuminate a room plays a big part in making a space feel either welcoming, or depressing. Check out this tripod inspired floor lamp from Wayfair. The best part: It’s on sale for almost half off right now – It’s $68.64, and regular price is $127! Although it’s not necessarily a furniture piece, tapestries are now being hung on walls to emit a gypsy-ish vibe. If you don’t want to use it on your wall, you can use it for picnics, or the beach. Hang it on your wall simply to cover up damages from nails, minor cracks and chipped paint. This piece is as versatile as it gets. An empty room provides plenty of opportunities for styling. You don’t have to be an interior designer to know where home decor should be placed. Use feng shui if it makes you feel more comfortable. No matter where you decide to settle down, be it an apartment or a permanent house, your furniture choices – and arrangements – will still be up to you. Ayah Granada is currently a content writer and editor for Scoopfed.com. Former student journalist/writer. Currently a full time writer, grad school student and part time bibliophile. As a TV series hoarder-slash-enthusiast, when she isn't binge-watching episodes,she tries to make up for lost sleep. Occasionally lost and is either always wondering or wandering. Trivial, millennial and often in denial. INFJ.